Building a solid electrical system in your expedition vehicle is a challenge. Aside from installing solar panels of your roof, a few other electrical components should be added to ensure an overall balanced, well-functioning electrical system in your truck. Note: As we pointed out in previous post, we are no experts in this field. Therefore, we would always advice you to work together with a professional to make sure your system is up to the task and installed properly. In case you are interested, at the end of this post you can find a little more information about where we purchased our electrical system for this project. 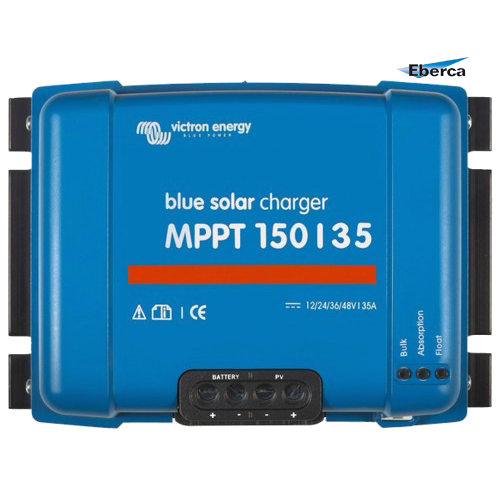 A MPPT (Maximum Power Point Tracking) is a more sophisticated solar charge controller, installed between the solar panels and your battery bank. 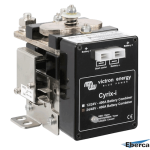 It converts the variable high voltage DC output from the solar panels into a low voltage DC input needed to charge your batteries. 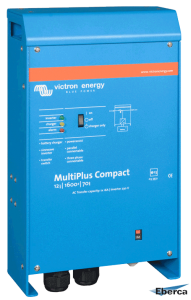 It maximizes the Amps that go into the batteries and thus increases the efficiency of your solar system. How nice is that! On our expedition truck we have 3x190W solar panels installed in series. This translates into approx. 108Vmpp (Vmpp = Voltage-max–power-point; peak voltage). The MPPT converts this high voltage to 24V needed to charge our battery bank. And by increasing the efficiency of our solar setup we even have enough power coming in on cloudy or colder days. 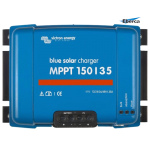 The MultiPlus is powerful piece of technology that is a battery charger and pure sine wave inverter in one. 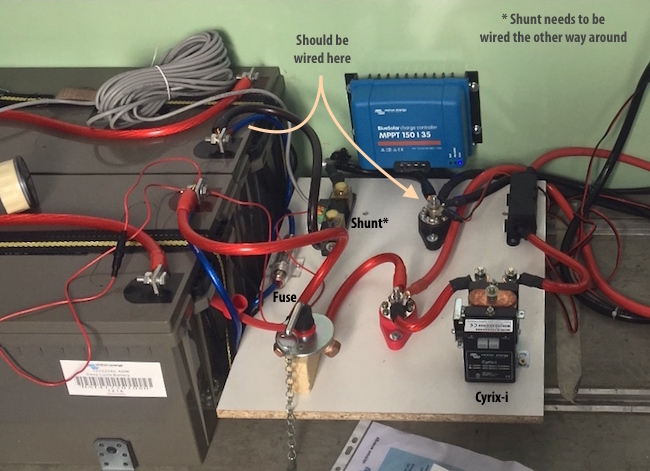 It ensures a reliable use of AC power source (shore or generator) to charge your batteries in times of need or directly supply all types of AC appliances with uninterrupted and stable electricity (e.g., computers, electrical tooth brush, espresso machine, …). *Note: Only with a pure sine wave inverter you don’t have to worry which AC appliance you connect to it. When using a modified sine wave inverter instead some AC appliances will be damaged. it will reduce the charging of the batteries to prevent overload. and when AC appliances are in use, it will boost the AC source’s output with power taken from the batteries – converting its DC into AC power. In case of an interruption in the AC source power it will automatically switch to the batteries without disrupting the workings of the AC appliances that are in use. Although our supplier recommended getting the Multiplus 3000 and 4 AGM batteries so we would be equipped with a comfortable powered home on wheels, our current budget just couldn’t cover that. To save us approx. €1400 and 130kg, they designed a smaller, but still balanced system with a Multiplus 1600 (max. power use at once = 1600W) and 2 batteries (220Ah). 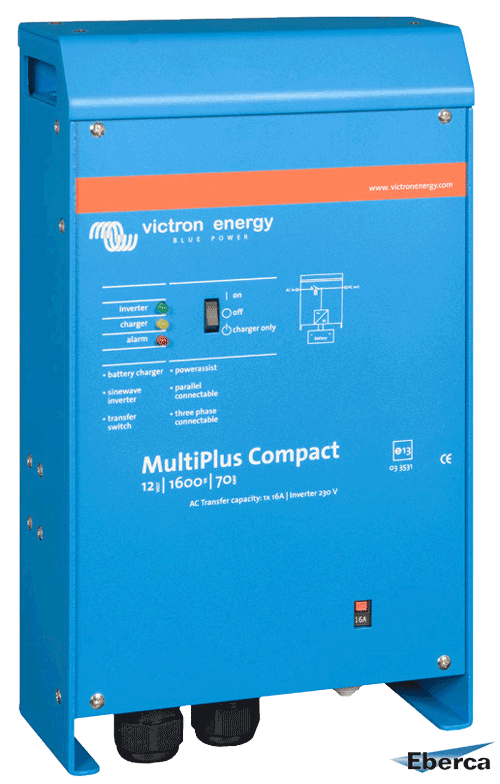 The Multiplus 1600 is compact and doesn’t require a lot of space to be installed. To compensate for the difference between the recommended system and the one we installed, we decided upon a larger solar setup (760W). When our current system would become too small (e.g., if we ever want to install an airco), we can still double it up since you can hang up to 6 Multipluses in parallel (we just have to keep this in mind when designing the interior). With the Cyrix-i you have less to worry about. It allows you to connect the household and starter batteries in your expedition vehicle. 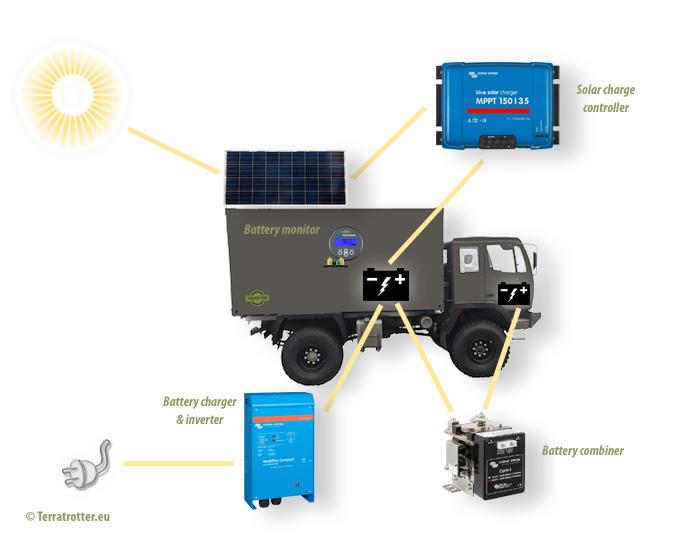 This way the solar system can also charge the starter batteries and the truck’s alternator can charge the household batteries as well. An additional advantage of the Cyrix-i is that it can also be engaged manually in case of emergency when for example the starter batteries are damaged. 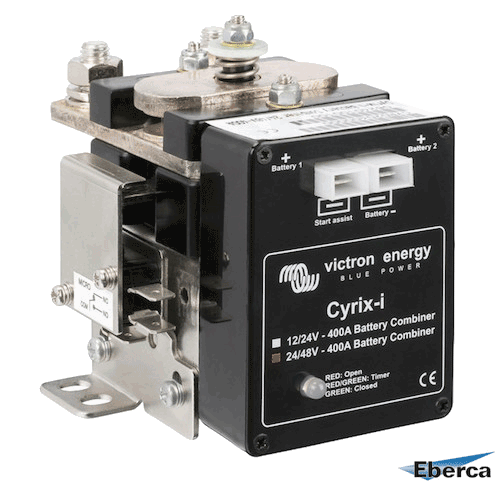 In other words the Cyrix-i is an intelligent battery combiner. A battery monitor provides you with a lot of information, the most important being how much Ah (Amp-hour) consumed and the state of the batteries (% charged). The shunt that is installed with the battery monitor has two sides: the [-]load and [-]battery side. When you are consuming a lot of electricity and the Ah number on your battery monitor is increasing instead of decreasing, you have connected the shunt upside down (i.e., you have connected the battery on the load side and the negative loads on the battery side). Simply turn the shunt around/switch the wires from side and it is resolved. When it’s a sunny day but you don’t see an increase of Amps coming in – in other words, the batteries don’t seem to charge – you should look at where your negative DC wires are connected. If any of your negative DC loads are wired on the battery side of the shunt (or on the battery itself), the shunt/battery monitor does not read this load. The only wire that should be connected to the negative pole of the battery is the wire coming from the [-]battery side of the shunt. 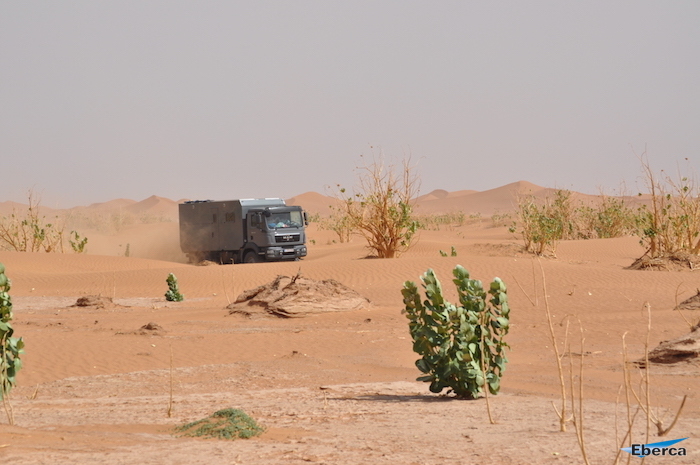 We were searching for not just any professional, but one that also knows the world of overland travel, and understands the complexity of building your own expedition vehicle. We found this expertise and service at Eberca Belgium*. We discovered Eberca through one of its people, Klaas Herpels. Klaas is a character; someone you will not easily forget. Not only has he build his own expedition truck (MAN TGM 13.290), he also uses this truck as his laboratory. The extensiveness of testing his own products and those of others is really beyond impressive. It seemed to peak his interest that he didn’t know much about the STEYR and he immediately jumped into his research about this truck… ha, typical Klaas (Note: That I was a researcher in my past professional life probably earned him an extra point). Michel and Erik from Eberca we met on site in Haasrode, Belgium. If I remember correctly Michel is a certified electrician with a specialization in automotive electronics. He knows the gritty details. Erik you find mostly crushing numbers and running the books, but he still knows a lot about the products; he was at least very helpful when we called him from Croatia with a technical question. Eberca works mostly with large bus/boat/truck companies, but that doesn’t stop them from helping people like us, DIY-builders. They designed a setup for us that fitted our needs and budget; saving us time and money to figure everything out ourselves. We – as we preferred it – installed everything ourselves, which they then checked afterwards for free. 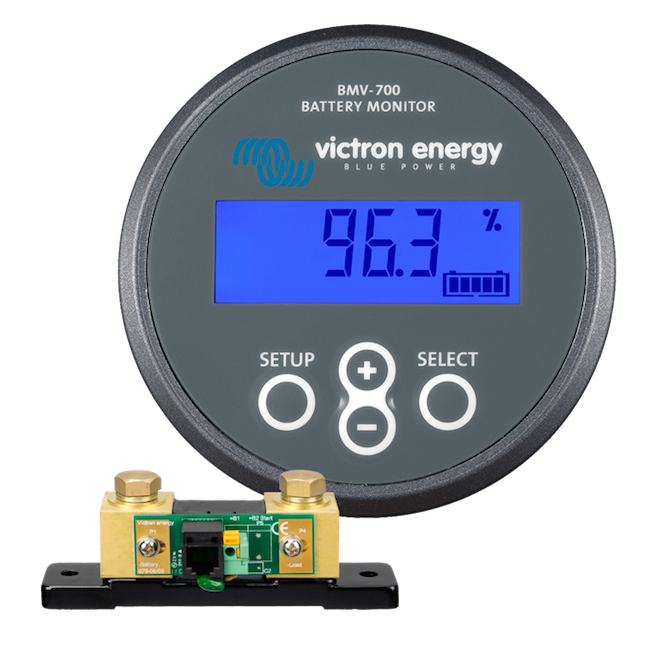 That they work with Victron Energy technology for the electrical installations had our approval as well. Victron Energy has a very solid reputation. Their technology has been used for boats, trucks, campers, off-grid homes etc. for years. Also their international presence makes it ideal for overland travelers. If we every run into trouble and need some replacement parts, its large distribution network will make sure we will receive these parts quickly. This in combination with having Eberca in our contact list, reassures us we have nothing to worry about. *Disclosure: Eberca Belgium became a sponsor of Terratrotter. BUT as always, any reviews or posts will be presented honestly. There is still more to come on this topic (incl. more pictures), but that is for a next post. Thanks for posting the equipment you use! think you are an expert in this subject. Fine along with your permission allow me to clutch your RSS feed to keep up to date with impending post.